(Office of Her Majesty – Press Department –Amman) - Her Majesty Queen Rania Al Abdullah attended a gala benefit dinner hosted by Jordan River Foundation (JRF) on Sunday night, to support its Child Safety Program (CSP), and raise awareness about child abuse issues in Jordan. 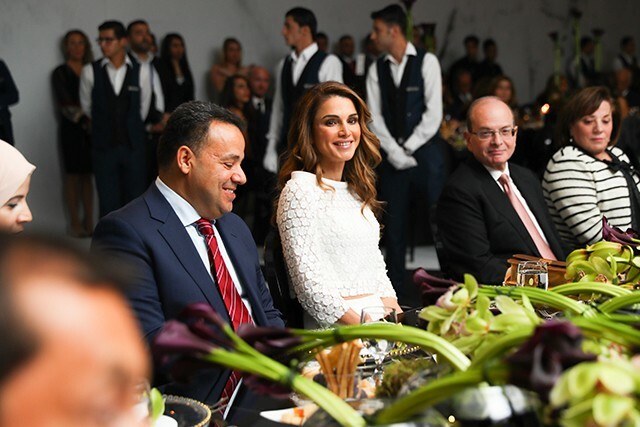 Queen Rania, who is JRF’s Founder and Chairperson of the Board of Directors, joined more than 500 guests representing the donor community and the private sector at the dinner benefit held at the Four Seasons Hotel Amman. JRF’s continuous efforts to break the stigma associated with reporting and addressing cases of child abuse were demonstrated to the audience in a powerful video about child protection during the event. Speaking at the event, JRF Director General, Enaam Barrishi emphasized the importance of the role each member of society plays in combating abuse and promoting a safe environment for children in Jordan. “Today we celebrate the successes we have achieved in combating abuse and promoting child safety. However, we still have a long way to go. We can start today by each one of you committing to join me in breaking the silence on child abuse in all shapes and forms and speaking against it,” Ms. Barrishi said. Barrishi also thanked Her Majesty Queen Rania for her leadership in establishing JRF’s Child Safety Program and recognized her for being the first to break social taboos about addressing child abuse outside the home. She concluded by expressing her gratitude for the benefit’s key sponsors, including the Arab Bank, Mr. Sabih Al Masri, Dr. Iyad Musbah, Hikma Pharmaceuticals, Mr. Saeed Darwazeh, Mr Mohammad and Mrs. Mahera Abu Ghazaleh, Sheikh Bahaa Al Hariri, Mrs. Najah Al Remawi, Mr. Ali Kolaghassi, Consolidated Contractors Company, Arab Potash Company, and Zain. The evening also featured a special musical performance by award-winning Lebanese-Armenian musician, composer, and pianist Guy Manoukian. The Jordan River foundation’s Child Safety Program (CSP) was launched in 1997 just two years after Her Majesty established the foundation. JRF has so far helped improve the lives of over 200,000 children and parents through child abuse prevention and intervention support services. JRF adopts a holistic model that encourages the genuine participation and engagement of all stakeholders working with children by addressing issues on three fronts: awareness, prevention, and intervention. Today, the JRF’s CSP experience and expertise reflect a model for child protection and safety efforts in the Middle East region, blending cultural appropriateness with international best-practice that is informed by evidence-based research.